Scotland Yard later released CCTV images, saying an altercation between two men led to the chaos in the area. 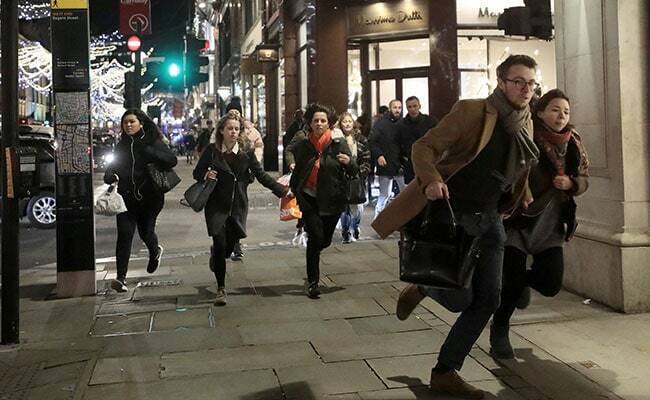 London: The incident at the busy Oxford Circus area in London on Friday that sparked a "mass evacuation" and left 16 people injured was caused by an "altercation" between two men, police said, ruling out a terror attack. The Oxford Circus area, one of the busiest shopping zones in the heart of the city, was placed under temporary lockdown after police received reports of shots being fired. However, Scotland Yard later released CCTV images, saying an altercation between two men led to the chaos in the area. "We are releasing CCTV images of two men we would like to speak with, following the incident at Oxford Circus earlier today," the Metropolitan Police said. The British Transport Police (BTP) said the altercation took place inside the busy Oxford Circus underground train station, "triggering a mass evacuation". "Officers believe an altercation erupted between two men on the platform. They would now like to speak to these two people in the CCTV images, who they believe may have information about the incident and the circumstances around the incident," a BTP statement said. "They would also like to speak to anyone who was at the station or in the area at the time and saw or heard anything that would have caused mass evacuation," it added. One person was transferred to a major trauma centre for leg injuries, while eight people were taken to central London hospitals for minor injuries. Another seven patients were treated at the scene. The London Ambulance Service said the injuries were sustained as passengers fled from Oxford Circus Tube station, in what witnesses said was "a stampede". Police said they received reports of shots being fired at a number of locations near Oxford Street, maintaining that there was "significant" panic. But later they found no evidence of any suspects or any gunfire and informed the public that it was safe to return to the area. "Our response on Oxford Street has now been stood down. If you sought shelter in a building please now leave," the Met said in a statement. "We have not located any trace of suspects, evidence of shots fired or casualties," it added. The police had, earlier, said that given the nature of the reports, they had responded as if the incident was "terrorist related". Armed officers and fire engines had been rushed to the area, where eyewitnesses reported scenes of stampede as reports of suspected shots being fired caused panic and chaos. The Oxford Circus and a neighbouring area were placed under temporary lockdown as police investigated the cause of the panic. BBC reporter Helen Bushby said she had seen a "mass stampede" of people running away from the underground station at Oxford Circus. People had been "screaming and crying," she said. Two underground stations in the heart of the city-- the Oxford Circus and Bond Street -- which had been shut down reopened soon after and the area seems to be returning to normalcy. The always busy area was particularly heaving with crowds of shoppers and tourists on account of the worldwide Black Friday discount shopping day.